This Scooter accessory that transforms your scooter into a super fun electric go kart that can accelerate, brake, turn on a dime, and pop effortless wheelies, all with simple, intuitive hand controls. Not only Stand to play, also can be like a Go-Kart, just buy this kart equipment. Fits for 6.5" 8" 10" most models electric balance scooter. Do not go over the speed limit. Always start slowly and familiar yourself with the transformer. Use safety protection such as helmet, kneepad for every ride. Only Kart Equipment. Not Included Hover boards. 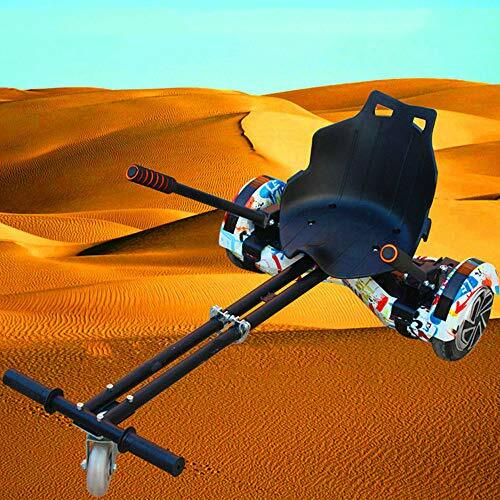 ★Transform your Self Balance Board into a easy to ride and very fun to drive cart in minutes. Compatible with 6.5, 8,10 inch Balancing board. Balance boards are not included. ★Rubber mat ensures that your hoverboards does not get scratched.PU wheel, more durable, more quiet during use. ★Adjustable frame length / seat position to suit both children and adults. Suitable for users with height 100cm - 200cm and up to 120kg in weight. If you have any questions about this product by GDAE10, contact us by completing and submitting the form below. If you are looking for a specif part number, please include it with your message.